Chinook is a high performance computer that has been tailored to meet the current and future operational needs of Department of Energy EMSL users and can perform more than 160 trillion calculations per second. RICHLAND, Wash. — The newest supercomputer in town is almost 15 times faster than its predecessor and ready to take on problems in areas such as climate science, hydrogen storage and molecular chemistry. 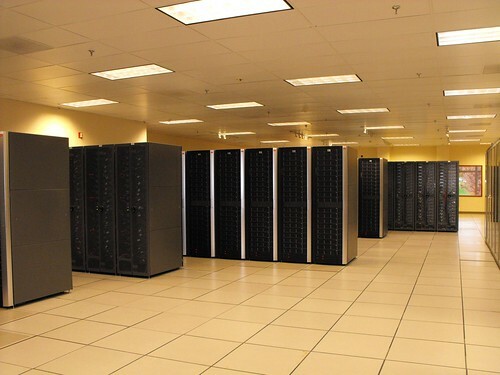 The $21.4 million Chinook supercomputer was built by HP, tested by a variety of researchers, and has now been commissioned for use by Pacific Northwest National Laboratory and the Department of Energy. Housed at EMSL, DOE's Environmental Molecular Sciences Laboratory on the PNNL campus, Chinook can perform more than 160 trillion calculations per second, ranking it in the top 40 fastest computers in the world (see the Top 50). Its predecessor, EMSL's MPP2, could run 11.2 trillion calculations per second. The Office of Biological and Environmental Research within DOE's Office of Science funded EMSL's supercomputer upgrade. Although housed at the Pacific Northwest National Laboratory, scientists the world over can use Chinook, competing for time through a peer review process. Users generally conduct research that supports the DOE's missions in energy, the environment, or national security. "When combined with EMSL's experimental capabilities, the new Chinook supercomputer will provide scientists from academia, national laboratories, and industry with an unprecedented research tool," said Anna Palmisano, DOE associate director for Biological and Environmental Research. "This new supercomputer will allow scientists to develop a molecular-level understanding of the complex biological, chemical and physical processes that underlie the environmental and energy challenges facing DOE and the nation." Chinook is fast and dexterous. Its designers tailored its architecture to handle scientific problems whose complexity require more than just power or speed. For example, climate scientists who are trying to understand the tiniest particles in the atmosphere or chemists watching how atoms tug at each other in a molecule need a different kind of supercomputer than physicists studying questions like the birth of the universe. Gas hydrates: Pockets of fuels such as methane are often found deep under the sea, trapped in a lattice of water molecules. Researchers hope to understand these gas hydrates both as a fuel source and as a way to store fuels. But for such a simple molecule, water has pretty complex chemistry. Researchers are using Chinook to help understand how water molecules form stable clusters. The work also gives researchers insight into how small particles in the air form clouds or break them up. Bacterial transformers: Communities of bacteria live and grow in the soil. And some bacteria have a taste for metals, a talent that can be used to clean up toxic substances in contaminated ground. Researchers use Chinook to understand the inner workings of these bacteria and how they form communities in order to take advantage of their clean-up skills. Green plastics: Industrial chemists can turn propane gas into plastics and generate only water as a byproduct with the help of compounds called catalysts. Chinook is helping scientists develop a new catalytic material based on small clusters of platinum atoms that does this at least 40 times more efficiently than older materials. Unlike a consumer buying a PC, EMSL purchased a custom-made machine from HP specifically designed for the demands of computational chemistry. After the computer's delivery and set up (see Chinook being set up here), EMSL asked its users to test the system during a period of time called acceptance testing. The many dozens of researchers who helped test the machine allowed Chinook's handlers to work out the bugs. Because there are so few clusters of this size, the testing was a vital part of the process, and the more realistic the testing, the better. "If you just have a few people running large jobs, the amount of communication back and forth between the nodes is very different than if you have a hundred people running calculations of various sizes and in various places on the machine," said PNNL's Erich Vorpagel, who manages all research projects on Chinook at EMSL. Chinook has 4620 Quad-core processors built into 2310 nodes. Each node can be thought of as the equivalent of four personal computers. But Chinook's nodes are more like supercharged PCs: the Quad-cores give each node the equivalent of eight processor-cores and 32 gigabytes of memory. The supercomputer was named after Chinook, or king salmon, through a naming contest by EMSL users. Researchers who want to use Chinook write proposals to EMSL and compete for time annually.